There’s an old joke about teenagers eating you through house and home, with termites, though, it’s no joke. They can literally eat right through your house requiring it to be demolished in the interest of safety. There are several tips you should keep in mind when preparing against termite infestation, including considerations of termite poison, termite tenting and general awareness about pest control and pest control equipment. Here are 7 hot tips to help you be better prepared for the termites. 1. Reduce Moisture: A good way to prevent termite infestation is to reduce moisture. The termites love moisture and need it to thrive. If you want to get a leg up on them, make sure you’re not making your property an inviting habitat. Any crawl spaces under your home should be lined with polyethylene. This material will be a house saver by creating a moisture barrier between the soil and your home. Another important consideration is that there is good cross ventilation in the wall vents. This is important because it keeps the wood dry. You should also seal all exposed wood with weather sealer. Areas that people often neglect are window seals and the edges of walls. If you don’t find those overlooked areas, the termites will! Another good idea is to trim bushes growing against the side of your house. Those bushes can contribute to the development of mold and moisture in the wood. Finally, it is a god idea to place sand barriers under fences, patios, and stairs. 2. Pre-Treat Your Soil: Another good preventive measure is to pre-treat the soil prior to beginning to build. There are barriers that can be built beneath your foundation so that the wood and soil never come in contact. These solutions are expensive, but try to keep in mind how much money it would save if it protected you from having to demolition your house! Such pre-treatment is also a pretty strong re-sell feature. So it is definitely a good investment. 3. Finding a Professional to Pre-Treat: Considering both the cost and what’s at stake, follow the sound rules for finding someone to provide this service. First, look for a service provider with an excellent reputation and preferably accredited with a third-party consumer protection organisation such as the Better Business Bureau. Make sure that the company is licensed, insured, and bonded, and also ask for references. Getting referrals from friends and family is always a good way to start. 4. Pre-Treatment is Structure Specific: And keep in mind, every structure you build on your property requires its own pre-treatment. Having treated for the house gives you no protection five years later when you decide to build a cabana by the pool. 5. Annual Inspection: It’s probably a good idea even if your property has been pre-treated, but essential if it hasn’t been; every year inspect your home for termites. If you notice mud tubes on the walls of your home, do not scrape them off, call an exterminator! 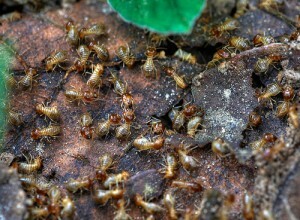 You likely have termites and it is vitally important to take action immediately. You might also see winged termites flying outside. They are sometimes mistaken for flying ants. Exterminators can confirm whether or not you have a termite problem. 6. Termite Tenting: If you do have termites, you’ll want to exterminate fast. Termite tenting, or fumigation, involves the complete covering of your home with a sealed, nylon tent, then filling the tent with a poisonous gas. This process normally takes one or two days, during which time the house is totally sealed off. It will be necessary to make alternate accommodation arrangements for this time period. The fumigant, termite poison, usually Vikane (sulfuryl fluoride), is colorless, odorless and leaves no residue, but left long enough, it will penetrate into the pours of wood, killing resident termites. 7. Termite Tenting Preparation: A safe extermination using tenting includes removal of all pets, fish tanks and bowls, and all living plants from the house. Foodstuffs and medicinals must be sealed in special plastic bags. These special bags will often be provided by the exterminator. Alternately, of course, such items can be removed from the house. Often, also, special treatment is required for mattresses or pillows. 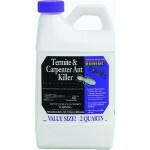 Finally, here are some products that can provide valuable ad hoc termite solutions. 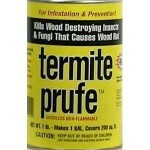 Keeps termites away up to 5 years in areas treated! It kills termites (including subterranean), carpenter ants, carpenter bees, wood infesting beetles and other wood destroying insects. For product features and details, see here. This is a half gallon, concentrate, termite and carpenter ant control, 13.3% Permethrin. 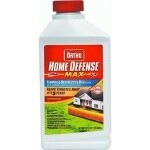 It makes 12 gallons of finished product, usable for indoor and outdoor applications. For product features and details, see here. This package of Termite Prufe powder covers 200 square feet. One pound of powder mixes with water to make 1 gallon of odorless and clear solution. Termite Prufe solution can be applied with paint brush or roller. Garden tank sprayer works best for attics, crawl spaces, decks, fences, logs and new construction. Applications can also be made by drilling approximately 1/4-inch holes and injecting solution into wood or wall voids. For product features and details, see here. Hope these 7 tips for termite pest control equipment and planning gives you the termite solutions you need to protect your home.